Sorry but I wont have pics until Monday. I came across a very old American lock co lock on a fence that appears to be very old. 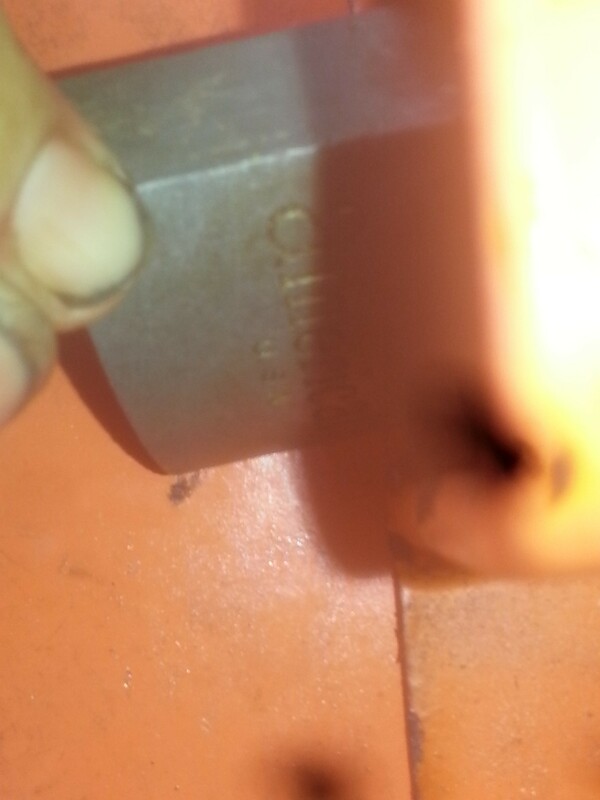 Says American U.S.A. it has a weathered brass or maybe steel body with steel hasp. Logo looks similar to the kind on the Junkoc(sp?) Bros locks but doesn't say that anywhere. 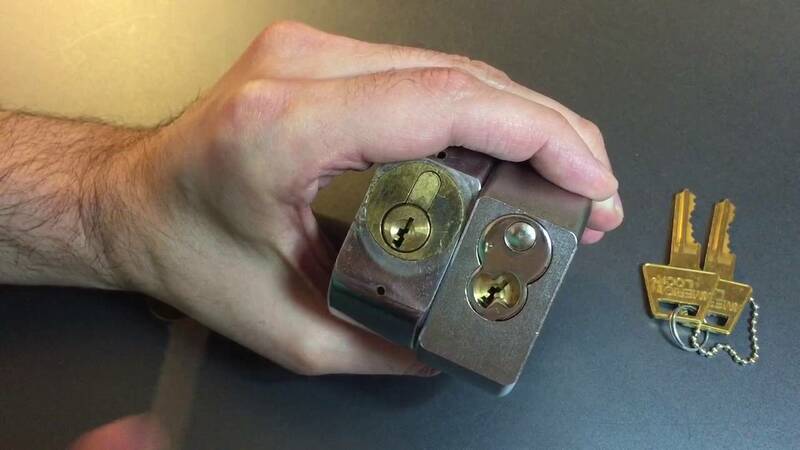 The thing that I cant find anywhere on any American lock image is that the cylinder looks similar to a euro, with the front part of the bible, above the cylinder, is visible on the bottom. 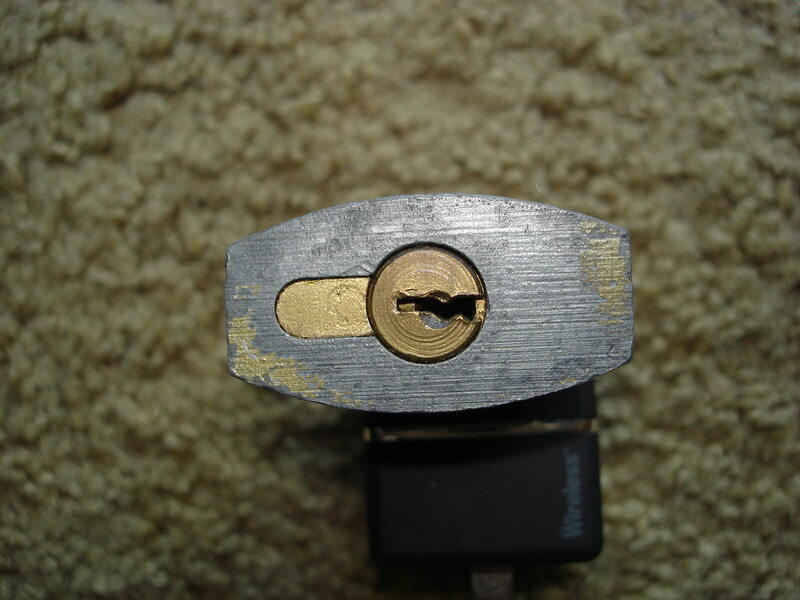 the keyway fits a modern AM3 key. 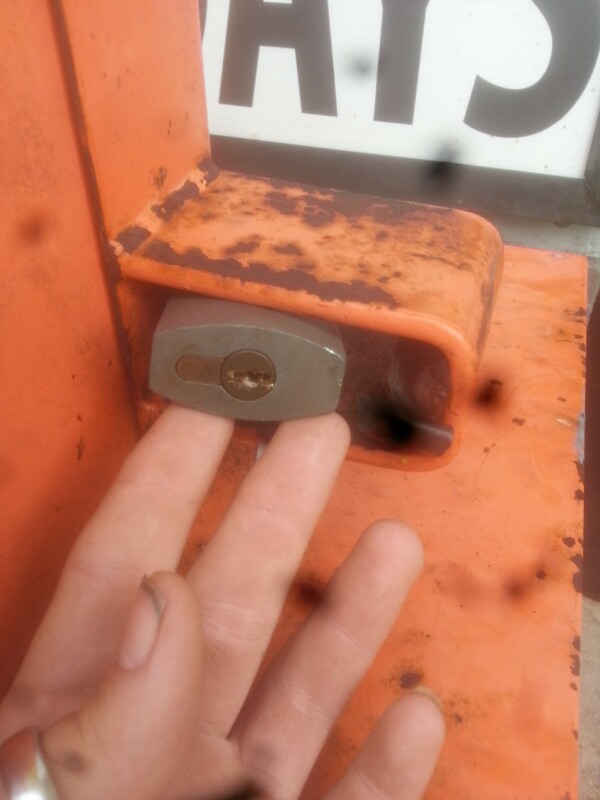 According to owner, this lock has been locked in place for 22 years, but appears a LOT older. Does what I described about a euro cylinder looking keyway jog any memories? Can you find an image? does the bottom look like the one on the left? Yes but without the outer brass circle. 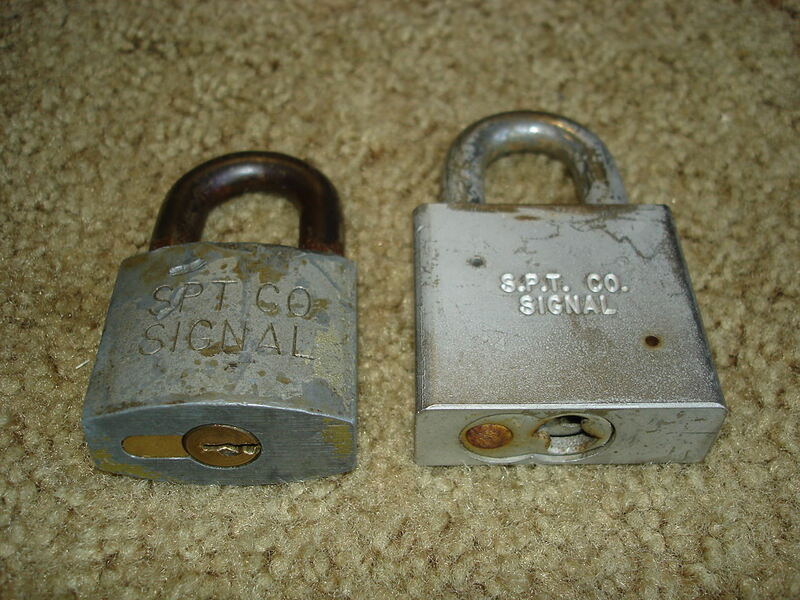 The padlock is about the size of a WB, the kind smaller than the big herculock padlock. Please excuse the dirty nails, i had just finished work. Anyways, the second picture shows the writing on there, its in a weird spot so its hard to photograph while its inside the enclosure its locking. The only text on it says American U.S.A.
My phone camera is broken, hence the black spots in the image. Gabesthomas wrote: ....I came across a very old American lock co lock on a fence that appears to be very old. Looks more like an old newspaper vendor stand rather than a fence? lol. At any rate, it seems what you're curious about is the history and/or age of it? Gabesthomas wrote: Does what I described about a euro cylinder looking keyway jog any memories? Can you find an image? 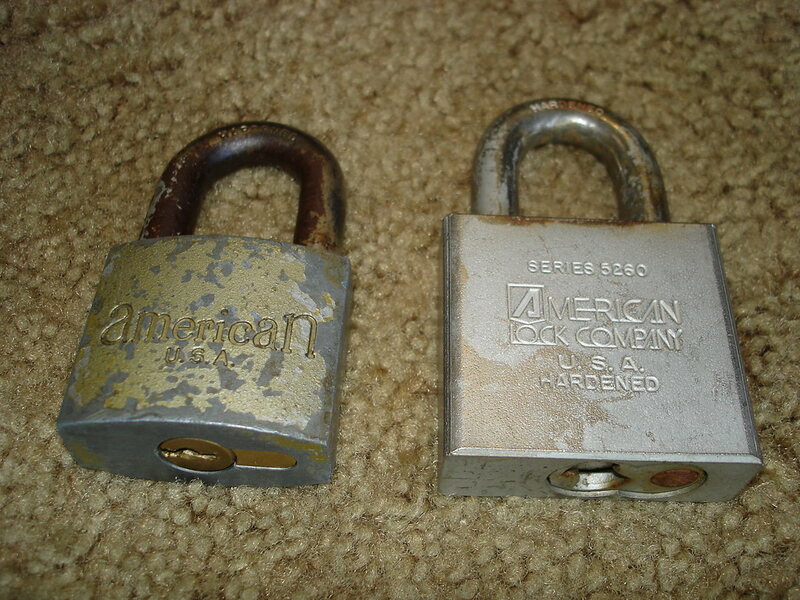 Yes, I do have a couple padlocks like that - the exposed bible, the logo, and usa below the logo. Unfortunately, as you mentioned, there's nothing else that would help date it. I do however have a Series 10 (wafer lock) and a Series 200 (pin tumbler), each baring the same logo design. And these two padlocks do have date codes (which might be of use to you): OGE and the other, VHG. Take a look at THIS thread for the date chart. This places the logo somewhere around the late 70's - early 80's. That's not to say the logo wasn't being used long before that, but hopefully this at least helps give you a start. And btw... WELCOME to the forum. You've found a great place! So are you a collector? A picker? Just generally interested in locks? Sorry it took me so long to get back to ya'll, my life has been very fast-paced and crazy lately. I am VERY proud to inform you guys that I am now a professional locksmith. I got hired by a locksmith shop! I didn't arrive until after they closed (only by a few minutes too), so I had to go to a different shop. The shop I arrived at had an employee working later than usual. She was on the phone with her employer, who was watching the cameras, when I came into the shop. 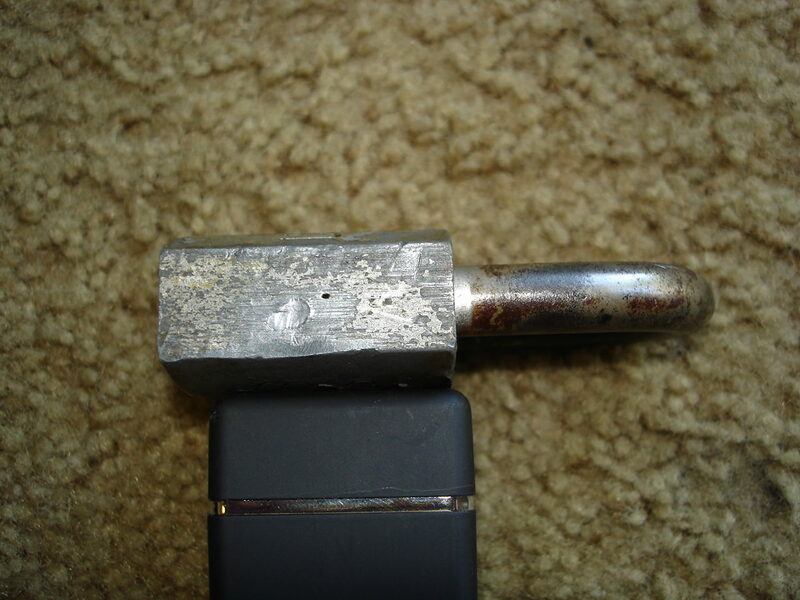 I saw an old mortise cylinder with a yale keyway and asked what the price was. When I told them it was for a challenge lock build, they asked if I could re-pin and re-key and the second I said "yeah" I got a job offer on the spot. I had practically given up on getting a job with a locksmith because I had tried at every shop. This shop is only a year and a half old so I never knew they were here. Its crazy how just the right circumstances can change your life- being a few minutes late due to traffic, the employee who happened to be working late on that particular evening, its as if the stars aligned. I've been with them a couple weeks and I love it. Hasn't felt like work at all. How do I verify this with the forum administration? A little background info, I've been a hobbyist since circa 2006. Earlier this year I delved back into my hobby and made a lot of progress. I started picking all types of security pins, SFIC's, tubular, disk detainer. I love it. I have a Best Padlock with Best Core that was pinned up by another local locksmith with the intention of making it difficult. It has 272737 bitting and all security drivers 3 serrated 3 spools, placed one after the other. It took me a couple days but I got it opened to control and operating. I figured when I sent the pictures to that shop that I might get a job offer, but go figure, I didn't. BTW the old American is connected to a chain, connected to an old newspaper vending machine, tying it all to the fence so nobody could steal the machine. I tried using bump keys and commercially made padlock shims with NO LUCK, UGHHH. I gotta run, I'm on a shop computer and I have some lockouts to take care of. I'm very happy to be here and to be part of the craft. I just found this thread since it's back on top. I saw this photo and instantly got a bitter taste in my mouth. It looked familiar, and brought back a feeling of resentment. I used to collect railroad related items, and had bought quite a few locks to add to my collection. One of the locks was an old Southern Pacific Transportation signal lock made by American. 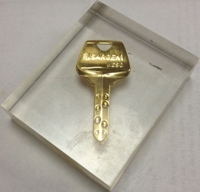 I didn't have a key for it at the time, so I took it to a local locksmith to see if they could impression a key. Instead, they had wire wheeled the original paint off the bottom and drilled a hole in the side, of what I considered a collectible item! They didn't even get it open. I've since found a proper key, but to this day I won't go back to that shop. I ended up plugging the hole with lead, but it still shows. Congratulations on your new job, but please do nothing destructive to a customer's property without their permission. Any way, I don't know the years they were in use, so I'm sorry I can't give you a direct answer. 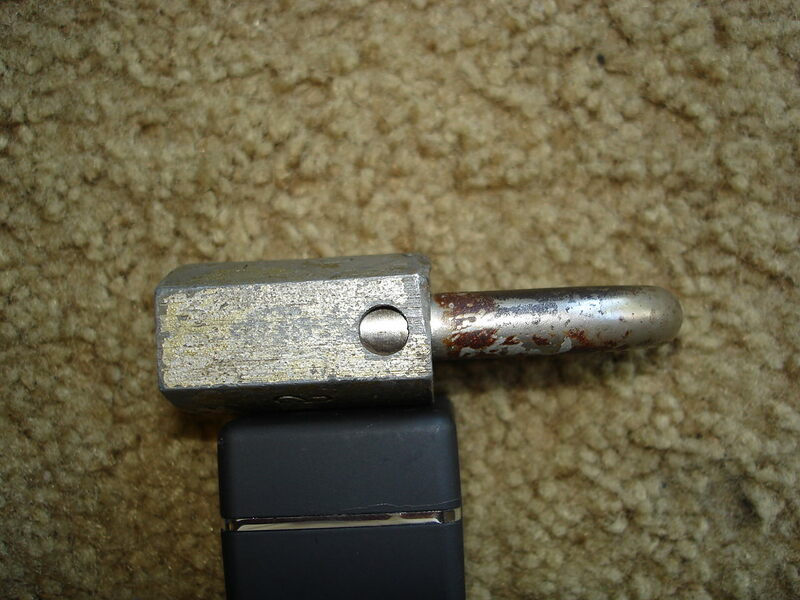 However, I'm certain they predated the other American SPT signal lock I have pictured with it. Maybe you can try researching railroad locks to help narrow down the era in which they were in use. Does the one you're looking at have the hole in the side at the shackle hinge like the next to last picture shows? It’s definitely the one on the left. Can you tell me what it’s like to pick it, if it’s possible. How many key pins? Five pins. I don't have a tension key that doesn't bind in the keyway, and they were starting to raise a bur. Since I consider this somewhat collectible, I stopped. I haven't done much padlock picking, so I'm not really the one that can give you a relative answer about picking it any way. Gabesthomas wrote: ....I am VERY proud to inform you guys that I am now a professional locksmith. I got hired by a locksmith shop! Congratulations! As the old saying goes; find something you love & you never have to work a day in your life. Gabesthomas wrote: How do I verify this with the forum administration?